Unlike the recently concluded NBA Finals, E3—the biggest gaming convention of the year—mostly happens in the wee hours of the morning for us. So for everyone unable to stay awake, here's a list of the new trailers you need to see. From the dark medieval setting of The Witcher, CD PROJEKT RED skips a couple thousand years forward into a high-tech cyberpunk setting. The trailer has some Ready Player One vibes, which is very interesting. Looking like a mashup of Destiny and Mass Effect, Anthem is EA and Bioware's new sci-fi flagship title. Finally, we get a sequel to our favorite JRPG and Disney mashup—remember, it's only been thirteen years since the last one. Master Chief returns in a trailer that looks like it's taking the game back to the style of the early Halo entries. Multiplayer Fallout! Let's hope this legendary, traditionally single-player franchise plays well with other people, too. The fighting game with the best physics (if you know what we mean) returns in a surprsingly male-filled trailer! After losing the number for the DmC reboot, the stylish demon hunter returns as Devil May Cry 5. If you weren't satisfied with the latest film, then the final game in Lara Croft's new origin trilogy series should fill in the gap nicely. 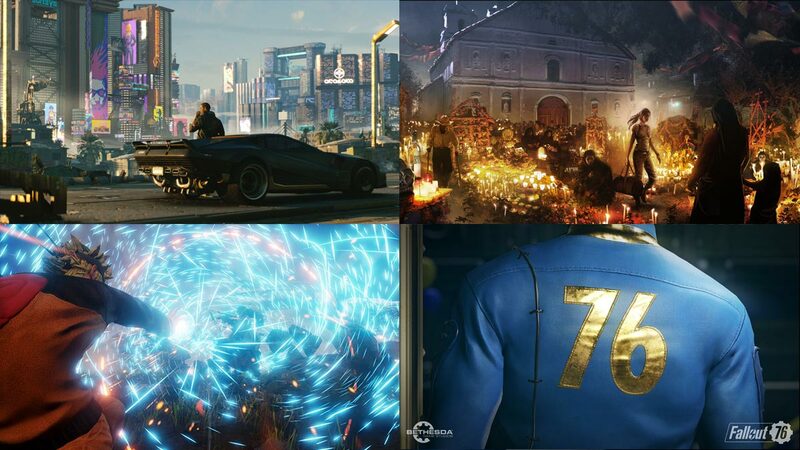 This is more teaser than trailer, but it'll be interesting to see what a sci-fi RPG from Bethesda will be like. The real MVP, it's been a while since Skyrim so this teaser is good enough because we now have hope to cling to. Finally, for all you mobile gamers, Command & Conquer returns with a new free-to-play game. Will this comshop classic be as good on a phone?